Soak ​up the sun and and the surf in Costa Rica's Tamarindo while getting a CrossFit-style workout each day and meeting new like-minded friends! Imagine the benefits, moves, and highlights of CrossFit without being confined in a gym or box. Coach Chris Sainsbury, owner of CrossFit Kingsboro in Brooklyn, NY, will combine daily conditioning workouts and WODs with the Costa Rican beach, grass, and natural resources for a one-of-a-kind experience suitable for athletes of ALL levels. ​But the workouts are just part of the experience! When you join us, you will be enjoying the resort's swim-up bars, powder-soft beaches, and local restaurants, nightlife, and activities. Coach Chris will lead one to two daily workouts that follow the format of cardio + strength + stretching. Morning workouts will be CrossFit-inspired, meaning they will incorporate conditioning plus a WOD (workout of the day) that touches on the principles that make CrossFit so popular and effective, without the heavy weights or lifts: constantly varied functional movements performed at high intensity. Evening workouts will be less intense and more restorative. These classes may include team-based fitness games, core work, and a restorative stretch at sunset. 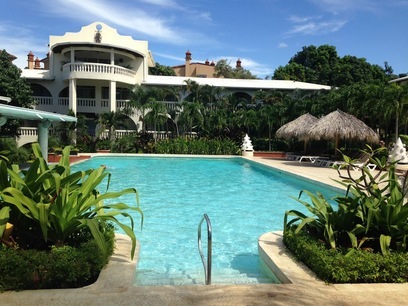 The Tamarindo Diria is the most iconic beach resort in the famous Costa Rican surf town, Tamarindo. This 4-star accommodation features beachfront property, gorgeous pools (including a quiet adult-only pool), and even a small casino... if you're feeling lucky! With more than a decade of experience as a personal fitness trainer, Chris Sainsbury has established himself as the trainer of choice among some of the biggest names in the entertainment industry. In addition to celebrity clients that include Marc Jacobs, Chris Brown, Rihanna, Puff Daddy, Idris Elba, Nas, and Kelis, Sainsbury has also trained at some of the most exclusive franchise gyms in New York City and Los Angeles including David Barton,Equinox, Crunch, and Work Train Fight. Chris’s first on-screen experience was in 2003 when Puff Daddy cast him as fitness trainer to members of the rapper’s reality show, ‘Making Da Band’. Soon thereafter Chris was one of Puff Daddy’s trainers as he prepared for ‘Diddy Runs the City’, a nationally televised campaign through which Combs raised two million dollars for charity while training for the NYC Marathon. Chris embodies and promotes a wholesome approach to fitness. He is a marathon runner, having completed the San Francisco and London marathons in 2014 and the Tokyo Marathon in 2013. This, in addition to achieving the Spartan Race “Trifecta”, having run three Spartan races last fall and a Tough Mudder in Florida. Chris also participated in the 10th annual AIDS/LifeCycle “Ride to End AIDS”, a grueling 545-mile bike ride from San Francisco to Los Angeles. The AIDS/LifeCycle works with both the San Francisco AIDS Foundation and the L.A. Gay & Lesbian Center to spread awareness and help people living with HIV/AIDS in the San Francisco area. Sainsbury believes in finding lasting motivation and empowering people to not just strive for temporary physical goals, but instead to adopt sustainable new lifestyles that combine health and fitness with general wellbeing. You can find Chris at his CrossFit box, CrossFit Kingsboro, in Brooklyn, or training private clients around NYC.